Hope is the end product of a series of choices and the upward momentum of spiritual growth. Making these choices isn’t always easy. But growth is the result of choices. Maturity and consequent happiness is a choice. We must make grown-up decisions in a world of less than positive circumstances. The spiritual life isn't effortless. Growth and maturity are often the result of facing difficult decisions. This runs contrary to the self-absorbed focus of our narcissistic culture which has rejected adult values for the immediate gratification of adolescent fantasies built on utopian dreams. In contrast, biblical hope or confidence in our certain future provides strength for facing present trials. A tough mental attitude in facing trials isn’t developed through the exercise of “no pain, no gain” mantras, but is based on understanding reality as God defines it. We face life in light of God's promises with a focus on the One who made the promise. Giving up on God’s promise of hope and endurance in order to cave into pressure may result in repeated worldly perversion that declines to a point of no return, the loss of eternal, spiritual rewards and the loss of all the blessings God has made available now and in eternity. For the believer, Grace is never diminished and salvation never lost, but a measure of rewards in time and in eternity may be surrendered permanently. So how do we develop the mental attitude strength to face today's challenges in light of eternity's promise? What do justification, reconciliation, and hope have in common. In this class we learn how Paul connects these to the cross and the so great salvation we have "in Christ." Only by living in light of this reality can we "be saved," i.e., be delivered from God's discipline and judgment in time ("wrath"). 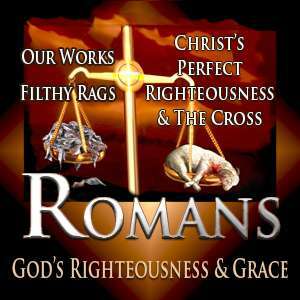 Romans 5 is a transition from the foundation of justification to the working out of our salvation which Paul is using more in terms of spiritual growth. The barriers between God and man are legal (a penalty required), spiritual death as the consequence of that legal condemnation and man’s works of unrighteousness. How has this legal problem been solved? Is personal sin an issue in our salvation? What is the issue in our salvation? How did sin and death spread to the entire world? What is personal sin? If it doesn’t figure into salvation, how is it dealt with it in our lifetime? If we mistreat someone, why is confession directed to our legal authority and not all about that person we mistreated?